Click here to go to our page on how (not) to trash a cal kit! "That test station is behaving awful flaky, what could it be?" Look for images of other disasters in the Microwave Mortuary! Your connectors and adapters cost someone a lot of money. Show some respect. Read the material below so you'll know how to treat connectors so they'll have a long and productive life. Connector saver - what's that? 1. Don't use pliers on a "stuck" connector for any reason. There are wrenches for every size adapter, even SMA bullets. If you can't fit a wrench to your stuck connector, see below. 2. Learn how to clean connectors with alcohol and cotton swabs. Cleaning the threads is good practice, but stay away from cleaning the center conductor of an air dielectric connectors such as 3.5mm, 2.9mm and 2.4mm. 3. Learn how to gage connectors to determine if they are out of spec. One bad connector can damage many. 4. Don't use higher frequency connector than you need. Save the 2.9mm and 2.4mm parts for millimeterwave measurements. 5. Never use any part of a calibration kit as an adapter. Ever. If you need a special adapter, buy it, borrow it or steal it, but not from the cal kit. 6. Use a torque wrench. For most connectors with 5/16 inch hex nuts, use 6-8 inch-pounds. It's OK to use less torque, but not more. Check out our page on connector torque! 7. Remember, righty-tighty, lefty-loosey! The total damage done by people turning stuff in the wrong direction is second only to damage caused by klutzes who "thumb" hybrids. 9. When you are tightening or loosening a connector, try not to spin the mating surfaces against each other. Here's some photos of what will happen! You should only be turning the threaded sleeve. Turning the mating surfaces means you are wearing out the connector for no reason other than you have poor motor skills. Did you ride the short bus? You've just bought a nice new set of coax adapters for that new lab project. They come with some plastic caps on each end... so you take off the caps and throw them out, right? Adapters and connectors are precision items, that's why they cost a fortune. So why does everyone treat them like common hardware? Check out the picture below, whoever "owns" a bench that stores connectors like this should never be allowed back in your lab! Those two-cents worth of stainless-steel screws are full of contaminates like oil, skin, and the worst culprit, tiny pieces of metal. Store them separately, and keep the dust caps on the adapters, or instead of being called a "lab rat" (a term of endearment) you will be called "persona non grata." Speaking of moronic behavior, check out the photo of the 7 mm connector below, then remember to never do this. What are we talking about? We're talking about setting the 7 mm connector down on its contact spring. The contact spring is the doohickey that allows the 7 mm connector to be sexless; it is a precision machined, gold-plated beryllium-copper spring contact that sticks out from the center conductor ever so slightly, so that when two 7 mm connectors mate the center conductor make spring contact. The way to protect the connector is to always spin the sleeve clockwise to extend the threads, then push on a dust cap. Someone paid a lot of money for this connector, show some respect! If you see someone treating 7 mm connectors like the one in the photo, bust them one in the mouth for us. Never drop a torque wrench (or any other hardware in your laboratory for that matter), since the shock of hitting the floor can degrade the calibration. In some laboratories and factories, torque wrenches that have been dropped have to be sent back to Metrology for re-calibration. We've heard this is sometimes a union labor trick, drop all the torque wrenches on the floor, and then there's nothing left to do but read the sports section of the Boston Herald. Oh well, better wrenches than GaAs wafers, right? We have a separate page on connector torque settings, located here, and a page on torque wrenches as well! The female to female SMA adapter is the cause of much pain in the microwave laboratory. Why? because it tends to get stuck. The photo below illustrates the problem. The "bullet" on the left is the cheapest possible adapter you can buy. Too bad it doesn't have a useful place to grip it with a wrench (sure, it has two tiny flat spots, but you can't get even the thinnest open-end wrench onto them once it's screwed into something). Notice the damaged threads due to some fool that jammed it into a male connector, over-torqued it, and after it was stuck used common slip-joint pliers to remove it. Now that the stainless-steel threads are damaged on this connector, it will damage every male connector that it mates with, and it will continue to get stuck every time it is used. Our sage advice is to throw this connector out! You can avoid ever having a stuck SMA bullet if you will always buy adapters that can accommodate a wrench. One inexpensive answer is to buy bulkhead-mount female-to-female adapters, as shown in the right of the photo above. Such a part is designed to be used to pass RF signals through a panel, with coax cables attached to both sides. It makes a great adapter for the lab because it has a 5/16 inch hex nut built-in. And, trust us, it doesn't have "double the loss" of the bullet on the left. Since it's bound to happen, how do you deal with a stuck connector? 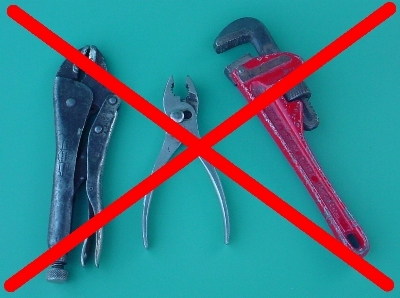 You should have on hand a pair of soft-jaw pliers, they pay for themselves every time you remove a stuck connector without damaging it. Below are two solutions to this problem that have been evaluated by Microwaves101. The larger pliers are available from Protech Products for $12.95 plus shipping and have replaceable nylon jaws. These are made in Japan, and will serve you for a long time. The plastic pliers are from Ted Pella and are $4.80 plus shipping. They are designed for chemists that handle nasty stuff that might dissolve metal pliers. It's hard to say how long these plastic pliers would last before they break, but they are the perfect solution for a microwave lab or factory that has a problem with tool theft (don't they all?) Buy a couple of dozen and put one on every bench, no one is going to rip off these Cracker Jack prizes! Then keep one of the Protech pliers locked up for emergencies. Whichever pliers you buy, tell them that Microwaves101 sent you! To view a better resolution picture of these pliers, click here. 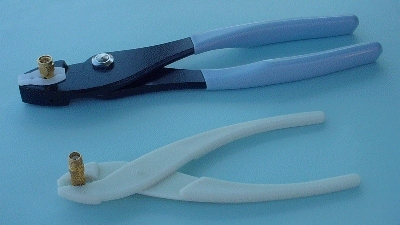 If you use type N and 7 mm connectors in your lab, you might want to pick up a pair of the larger "AN connector pliers" (pictured below) that are marketed by all the big tool companies such as Contact East, for around $30. The smallest diameter connector these can handle is 3/4 inch, so they won't help you with stuck SMAs. Do yourself a favor and remove pliers such as these from your all of your microwave lab benches, unless you enjoy paying for replacements for all of your damaged connectors! Connectors should be cleaned and inspected periodically. It isn't hard to do, all you need to clean connectors are some cotton swabs and fifty cents worth of isopropyl alcohol, as shown below. Say, who's the model in the picture? You can tell that Dude is hot! Like an otter!!! "You state that to clean RF connectors to use isopropyl alcohol. 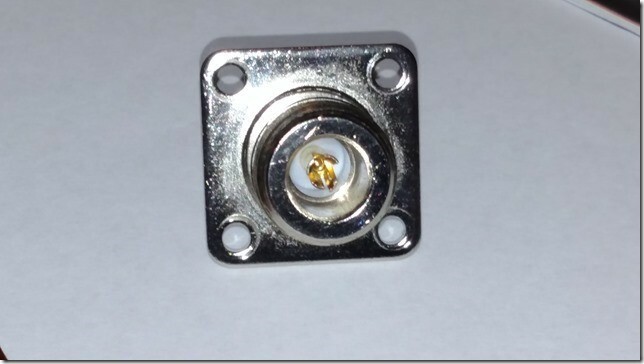 I have always found that using this type leaves a serious film on my connectors and did not want to risk the electrical integrity of my measurements. Instead I went to a denatured alcohol. This leaves a very clean finish and I never had a problem with a film. Although I never found a problem with the film, I think most people don't know that this happens with regular isopropyl alcohol." Cleaning connectors involves starts by dipping the swab into alcohol. Outside threads of connectors should be rigorously cleaned as shown on the left below, using a circular motion. Cleaning the inside of a connector (center photo) requires some common sense, and a gentle touch. It's OK to clean the inside of an SMA male and female connector, everything is supported with the Teflon dielectric. However, if you clean an air-dielectric connector, you have to be extremely gentle. Don't do anything that would bend the center conductor. Better yet, just clean the outside threads of the females, the dirt that is inside the males will eventually end up there anyway. Throw out the swab when it looks like the swab on the left in the photo on the right! When connector threads are cleaned, you will be able to hand-tighten all connections to within 1/2 turn of the proper torque. Note that if you find yourself having to tighten a connector from start to finish with a wrench, something is wrong with this picture. Either you are mis-aligning the connector while you are tightening it (which can cause damage), or one of the connectors in the pair is already damaged. Connector damage is often the result of a component that has been dropped and lands on the threads of the female, causing the connector to become slightly "D-shaped" instead of perfectly round. If you have a connector like this it needs to be replaced, don't keep jamming it into other connectors, you are spreading the bad news. A connector saver is an adapter that you put on an expensive piece of equipment, and make all future connections at this interface. This protects your equipment, because when some idiot trashes the connector saver, you replace a relatively inexpensive adapter rather than send your equipment out for repair.